You could give thanks on Thanksgiving, or gorge yourself on festive food alongside your bickering family members, but we say there’s nothing like shopping from the comfort of our gaming chairs and basking in the company of our favorite guildies! 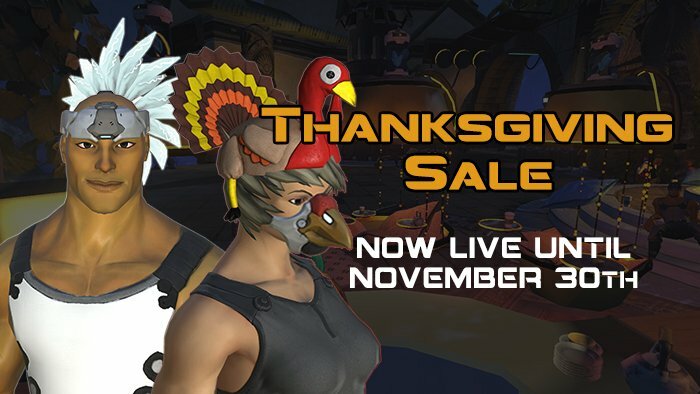 Today, in celebration of the overwrought annual event that is Thanksgiving, Black Friday, and Cyber Monday, we give you this guide to the best MMO gaming deals (and a few themed events too) that we could find. Go forth and buy all the things. Steam is also running hefty discounts on The Crew’s base game, War Thunder packs, Defiance season passes, and Neverwinter’s bundles. Thanks, BBB! We’re sure we missed some, so feel free to add more in the comments below for the benefit of the whole community. We’ll be updating as we go (plus we already know of some sales embargoed for tomorrow that we couldn’t include just yet). Happy Thanksgiving! Previous articleThe Daily Grind: Are you playing MMOs on Thanksgiving? LordSolarMacharius Wandris Polyanna There is an expectation of being able to actually play the game after buying all those unlocks, however you are still stuck with game breaking restrictions as I listed. It is borderline unethical sales practice and false advertisement. Weekly passes are bad enough but you can still progress over week/months. However the credit cap and no forums are absurd. Just an FYI the DDO expansions and starter packs are even BETTER than advertised. What they don’t say is if you buy the collectors editions of the xpacs (7.50$ and 5$ right now) you get 2000 turbine points with one and 1000 turbine points with another. That’s like 30$ of turbine points on top of getting the expansions for about the price of 1 month’s sub!!! carson63000 LordSolarMacharius breetoplay Great news. Glad to hear it. LordSolarMacharius carson63000 breetoplay Yep, cheers, they arrived some time in the few hours following my earlier posts. Got ’em! carson63000 breetoplay When you go to the store page, the first 2 items of the 3 in the first page have a price of 0 gems. You need to buy them. They are then replaced by the same item but these ones cost gems. Unlimited Amazon disk space for a year is $5 today. Forgive this being off topic, but I bet there are a couple of gamers who don’t have off-site backups. Interestingly enough, Hearthstone doesn’t seem to be having any kind of sale at all. WoW, HoTS and SC all are. Hmmm…. Satanixx The Secret World is awesome. I feel bad that Funcom is having financial problems. They actually innovate which is rare these days outside of indie studios. Armsbend Bummer. I would have totally shelled out for a discounted copy of Diablo. I already have the SC franchise. Ironweakness That’s one of the reasons I dislike Amazon. Ever since they proved that they got busted shafting returning customers with jacked up prices using algorithms while trying to sucker in new blood with deals on the same merchandise. I’m not sure if they’ve curbed this practice (I hope so).